praktischArzt is a career portal in germany for doctors and medical students. We provide a lot of useful information all arround the physician career and thousands of job offers on our page. As part of our information portal we show you on this information page how to become a doctor in Germany. You are a medical doctor / physician and come from an Arabic country, Asia or from the EU, and would like to work in Germany? You are a student and would like to study medicine in Germany? In the follwoing chapter, we describe how to study medicine in Germany and how to find a job as a foreign medical doctor in Germany, get the German equivalent to your medical license and approval to work as a medical doctor inside Germany. Because of the shortage of general physicians, medical doctors from abroad are in demand in Germany. However, you have to meet certain requirements. To get a university place in Germany to study medicine is very difficult, as well for foreigners as for German citizens. The reason is that university places in the field of medicine are very limited. Limitation is based on the numerus clausus (NC, Latin for „closed number“). Only students with the best grades in the university-entrance diploma which is in Germany called Abitur or foreigners with an equal degree from other countries have a chance to get one of the highly-demanded university places. Secondary diplomas which are equivalent to the German Abitur and have been received inside the European Union will be usually also accredited in Germany. 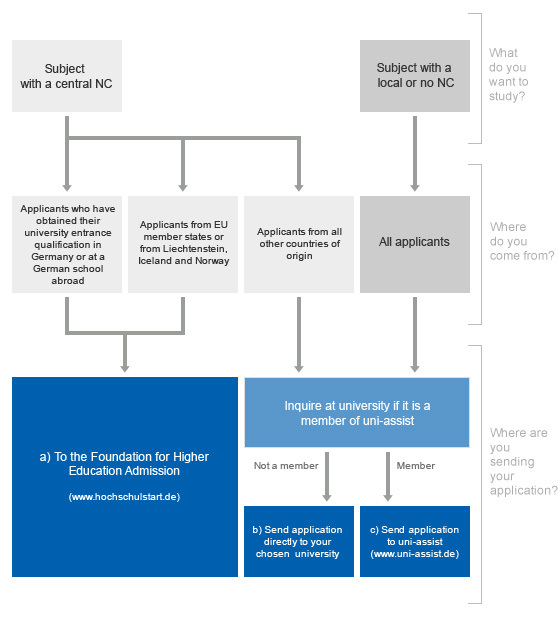 If you come from outside the European Union your degree is not automatically accredited and you have to apply for the Hochschulzugangsberechtigung. You can check yourself how your foreign degree is accredited in Germany using the anabin database. If your secondary diploma is valid in Germany you can apply directly to the universities using Uni-Assist which is the University Application Service for International Students. The completion of your medical degree in Switzerland or in any member state of the European Union means that your medical license is automatically recognized in Germany and you are able to practice medicine once you have proved you have a certain knowledge of the German language. You need the official, state-issued accreditation, the so-called „approbation“. The approbation is an unrestricted occupational licence. Recognition is generally not required if you are resident in an EU state and only wish to provide services in Germany on a temporary or occasional basis. However, you must notify the authorities regarding this employment activity. The Goethe Institut offers German language courses which are accredited by all Authorities. Visit their homepage Goethe Institut for more information. You have the opportunity to apply for a direct equivalence checking of your completed medical study abroad by the German Medical council in order to gain approval to work. In most cases however applications from non-EU /EEA countries do not meet the requirements to successfully pass the equivalence check. Alternatively you can send your documentation to the “Landesprüfungsamt für Medizinische Heilberufe“ (LPA) of the federal state where you want to work which can then issue you with a temporary permit called „Berufserlaubnis“ to practice medicine in Germany for a period of up to two years. You also need to secure a placement as a „guest doctor“ (Gastarzt), which is normally run along similar lines to an unpaid internship (some clinics offer you free accommodation). It would of course be advantageous if you were able to apply for a grant from your country of origin. Prerequisite for a license to practice medicine in Germany is of course the B2 / C1 language certificate. Was ist ein Gastarzt und wie kann man als ausländischer Arzt in Deutschland eine Stelle finden? If you manage to secure an internship at a clinic inside of Germany you can then apply for work and residency permits.The goal of this internship is to prepare you for the so-called knowledge exam in order to receive a permanent right to practice medicine inside Germany. This is an oral-practical exam that is regulated by the approved authority of the state. The exam itself should last at least 60 minutes in which you have to exam a patient in German in order to establish the medical history and the actual medical status. Internal medicine and surgery are the main subjects that are tested. However knowledge of other fields is also required. If you pass the exam successfully, you will receive infinite approval to practice medicine in Germany. You can then look for paying work as „Assistenzarzt“ (assistent physician) in order to complete your 5 year residency before you can take the relevant exams to become a specialist in the field of your choice. Your chances of finding a job in a German hospital are actually depending more upon your language skills than upon your actual practical experience. That is why we highly recommand to get the necessary German skills at the Goethe Institut in your home country. 1. Contact the Geothe Institute for the language course B2 (Independent language use) and language course C1 (Proficiency). 3. Apply to the State department for medical practice „Landesprüfungsamt für Medizinische Heilberufe“ (LPA) of the federal state of the clinic which accepted you as a guest doctor, to obtain a temporary license of medical practice „Berufserlaubnis“ that allows you to work as a guest doctor for up to 2 years in Germany. 4. Within the period of the 2 years pass the medical knowledge exam to gain the equivalency of an medical degree in Germany in order to receive infinite approval to practice medicine. 5. Now you can apply to clinics for a paid job as a resident with the aim to become a specialist after 5 years. Your first job will be on Assistenzarzt (assistent doctor). After 5 years you can become a specialst called Facharzt. praktischArzt is looking forward to support you with job ads in Germany. „Working and living in Germany“: 0049 30 1815 1111. You are looking for a job as a doctor in Germany? You can find jobs for young professionals here in our job list Assistenzarztstellen directly on our page. You are already a senior professional? Then you find all jobs in our list Facharztstellen als directly on our page. Stay updated with our blog´s „International“ category! There you will find reviews, tips and tricks and of course further informatiuon for international doctors and medicial students on a regular basis. We wish you all the best and good luck with your applications in Germany.